I spent some time on the phone today with my business partner and best friend, Audrey McClelland, and we realized that this was the first time in 10 years that we didn’t come out with an official holiday guide. I’ve posted a few roundups here and there (10 Hostess Gift Ideas & Disney Holiday Gift Guide), BUT NOT AN “ALL IN ONE” GUIDE. That made us sad! There is no way that I can whip one up together this week. I recognize that you all need enough time to shop and ship. I am a bit out of the loop when it comes to the hottest toys these days. My kids really just want Fortnite money – whatever that’s called. But beauty picks? Well, that I can do with my eyes closed! That I will pull together right now! If you are looking for stocking stuffers or if you want to put together a great gift basket filled with items that you know your recipient will love, here are my top ten favorite products that I am currently using right now. If you watch my Instagram stories, I usually link to these every few weeks because I want my online friends to know how great each and every one of them are. I’ve tested one through ten and use them over and over again. You cannot go wrong with this list. 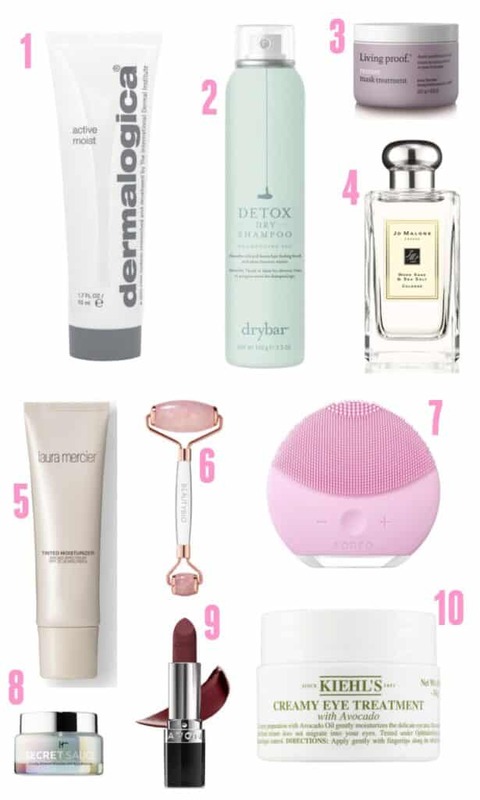 WIthout furtner ado – here are my favorite beauty buys for 2018. DERMALOGICA® ACTIVE MOIST – Active Moist is an oil-free, lightweight moisturizer that hydrates combination skin. DRYBAR DETOX ORIGINAL SCENT DRY SHAMPOO – A dry shampoo that helps prolong your blowout while scenting hair with notes of jasmine, sandalwood and Madagascar vanilla. LIVING PROOF® RESTORE MASK TREATMENT – A deeply conditioning treatment that repairs dry, damaged hair by nourishing each strand, leaving hair visibly healthier, stronger and shinier. JO MALONE LONDON™ WOOD SAGE & SEA SALT COLOGNE – A cologne that helps you escape the every day, along the windswept shore. LAURA MERCIER TINTED MOISTURIZER SPF 20 – A sheer-coverage multitasker for a healthy, no-makeup look and a natural dewy finish. BEAUTYBIO ROSE QUARTZ ROLLER: A rose quartz roller that provides a calming facial massage and cooling sensation for stress relief, along with a myriad of other benefits. FOREO LUNA™ MINI 2 COMPACT FACIAL CLEANSING DEVICE – LUNA mini 2 is an enhanced T-Sonic™ facial cleansing brush with eight adjustable intensities for a fully customizable cleansing experience, plus three zones, a 50% larger body and extra-long touch points for an even better cleansing experience. SECRET SAUCE CLINICALLY ADVANCED MIRACULOUS ANTI-AGING MOISTURIZER – IT COSMETICS – A luxurious moisturizer that utilizes powerful fermented ingredients and gives you clinically tested anti-aging, radiance-boosting results. KIEHL’S SINCE 1851 CREAMY EYE TREATMENT WITH AVOCADO – A nourishing eye cream that gently moisturizes your delicate undereye area. Do you use any of these products already? Looking forward to checking some of them out for yourself? Would love to hear what you think about my list! But because I can’t just leave you with ten items, I wanted to tell you about a few more items I found online. If you have someone on your list that is into the bright and the bold, this eyeshadow palette just might do the trick. For the beauty buff who is also a tech fan, this lipstick USB is a TRIP! I hope Santa leaves me some rose water from Mario Badescu in my stocking because I actually really love the scent. And if you want to get fancy, you could always throw in this lip therapy cream that promises to heal overnight. I haven’t really tried out The Beauty Chef yet, but I’ve been intrigued by the whole line. That might be something to look into for one of your beauty-loving gift recipients. I didn’t want to put two things from It Cosmetics, but this CC+ cream is to DIE for. I use it all the time!! And ok – one more thing – I don’t have any hair care tools on the list!! I can’t post a beauty list without a flat iron or a curling tool, right? I own a few products from both Dyson and T3. So, check out either the Single Pass Curl or the Supersonic. GREAT products!! Will last you a lifetime!